Jacob Wrey Mould had been in the United States only a year in 1853 when he was consulted by Moses H. Grinnell regarding plans for a new Unitarian Church of All Souls. The church, under the strong guidance of Rev. Dr. Henry Whitney Bellows, had been searching for an adequate design. When architect C. F. Anderson presented his plans, Grinnell, the president of the trustees, was less than impressed. Although the trustees had approved Anderson’s design, they were vetoed by Grinnell. Mould had been hard at work designing decorative elements for the Crystal Palace Exhibition in Bryant Park. His vibrant, colorful work was novel to New Yorkers and, for some, would prove over-the-top. Built on the southeast corner of Fourth Avenue and 20th Street it was completed in 1855. Although contemporary critics termed the style “Byzantine,” it was actually Italian Romanesque, modeled loosely on the 14th Century Basilica di San Giovanni Battista. In fact, the church would proudly display for decades “elaborate drawings of both San Gio Battista and All Souls,” according to Henderson, to demonstrate the similarities. Critics, however, were quick to react. 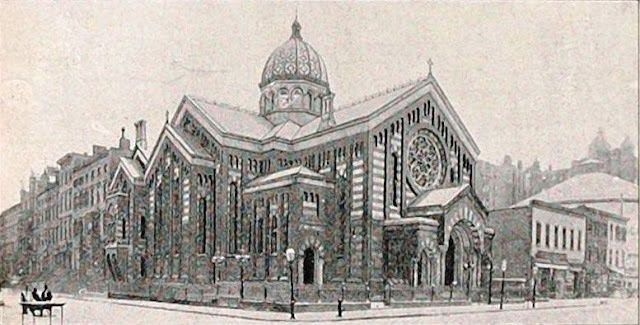 It was called by one, “the most unfortunate ecclesiastical edifice ever to be erected not only in New York, but anywhere else in the world for that matter.” The congregation, who felt they now owned a “white elephant,” according to Henderson, was even more shocked when it was revealed that Mould had gone $48,000 over budget. It was Grinnell who helped relieve the financial crisis from his own pocket; however the lofty campanile the architect had originally intended, matching the one at the Basilica, would never be built. 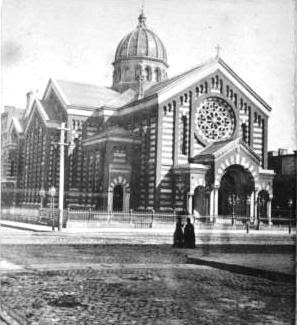 Bellow’s daughter, years later, would remember that she “found the church handsome and unique, though it excited much derisive comment and received many nicknames.” Among those irreverent nicknames, the two that quickly gained popularity were The Church of the Holy Zebra and the Beefsteak Church. Dr. Bellows died in 1882 and four years later a bronze memorial table with a life-sized relief of the minister by Augustus Saint-Gaudens was unveiled in the sanctuary. Early in 1929 the congregation sold the property to a developer for $475,000. The church sat empty and neglected for two years before being destroyed by a fire on August 23, 1931. As The Times had predicted, New York lost “one of the most remarkable architectural creations ever placed upon Manhattan Island.” Jacob Wrey Mould’s atypical and wonderful Church of the Holy Zebra was lost forever.